AGM Batteries charged on Motorhome/Caravan 13.5 volt Chargers? "Thanks for sorting out our Motorhome last Wednesday. We have had no further problems with the 12V mysteriously cutting out. Wish we had found you years ago when it first happened. Thanks hugely for your help and explaining how our system works…… Invaluable!". If an AGM battery has greater charge acceptance and can draw twice the charge current, then doesn't that mean an ordinary battery mains charger will be asked to work twice as hard with an AGM battery? If the Dealers are also, incorrectly, saying that AGM's can additionally be discharged right down to 80% Depth Of Discharge (DOD) and much lower than the usual Wet acid batteries 50% recommended DOD, then won't the charger work even harder still to recharge a battery from such a low state and with double the current? Join the two together to create an AGM load 4 times greater than a Wet/flooded battery charger was designed for. Could that be why we are hearing of so many failed Sargent PX300's, which isn't optimised for AGM batteries, from Swift motorhomes with AGM batteries? One motorhome had suffered three Sargent PX300 failures, the motorhome owner came to us because while the Dealer had replaced them under warranty, they openly declared (as did Sargent and Swift) that they didn't have a clue as to the reason for the failures. Doesn't common sense indicate a none AGM optimised charger, without the correct AGM 14.8v and 4 times the current capability, won't charge the AGM batteries properly? Will that also not result in the AGM batteries failing prematurely? The below battery is one of several models being rolled out by Swift. You can see from the label the minimum charge voltage is 14.4v and the ideal a massive 15.0v. Whichever way you interpret that, the battery likes a voltage much higher than the 13.9v many UK motorhomes charge the habitation battery at. You will note that Wet Acid batteries never have the charging voltage printed on the casing, so to print a much higher voltage range must mean it is critical to it's operation and lifetime? Note the lower than usual Float/trickle voltage of 13.65, not the usual 13.8v of most motorhome chargers. Also ask yourself why the bottom line says "Do not Charge in a Gas tight container" if these are as 'Gas free' as some retailers claim?. How will that AGM battery cope on a mains charger designed for wet batteries that only delivers 14.3v and half the current required? But with AGM's having such a history of premature failure, plus the technology being superseded by the latest Enhanced Flooded Batteries (EFB), why would anyone want AGM's in their vehicle anyway? If you look at the Banner web site you will see that AGM technology has had it's time. Almost all the new quality Leisure batteries currently being announced are Flooded/Wet EFB technology. AGM hardly gets a look in on the new battery ranges. The Banner website actually states that "EFB is the technology of the moment". The latest big truck batteries are also coming onto the market with EFB technology. If AGM is the 'Super Tough' technology we were being told it was, why are hard working Truck Batteries now being rolled out with EFB technology? Banner quote on their web pages that one of the Weaknesses of AGM is it needing 'A higher charge voltage' (as stated above) and shorter life under high cyclic loads, see the chart below -. Shorter life under high cyclic loads? That is quite a turnabout, as 4 years ago the retailers marketing arms telling us that AGM batteries were the heavy duty option, excelling at high loads. Wasn't that the reason they were adopted for Stop/Start cars, because they handled the high duty workload better? That AGM have have not performed as the marketing men claimed is further supported by them falling out of favour in the Automotive world Audi, VW, BMW, Seat, Mercedes and Skoda are ditching AGM batteries from their cars and are moving back to Lead acid Wet/Flooded technology that are also lower cost than AGM. Landrover are also moving away from AGM. Conventional wet acid/flooded Starter batteries in Cars have previously had an average 9 year life. Fitting double the cost AGM's with claims of more than double the life should mean they last 20 years. So why are AGM's being replaced in cars after less than 3 years life? While an AGM might appear on paper as a suitable battery technology, just as they haven't worked in Cars, they don't work well in motorhomes, but for several different reasons. We have been campaigning for about 5 years for battery manufacturers to provide better awareness about the special needs of AGM batteries in Motorhomes because the charging systems that are mostly installed, both mains and Alternator, are not appropriate. The biggest and nicest surprise to support our drive for better awareness that most Motorhome and almost all Caravan chargers are not suitable for AGM batteries, has come from a Caravan and Motorhome Club magazine article. In September 2018 issue, Page 114, is an article on 'Choosing Leisure Batteries'. For the first time ever, there is published advice from the Caravan and Motorhome industry to actually avoid AGM batteries!! Hopefully things will now change and the whole industry will also start warning people about AGM's in motorhomes? But it isn't just the 230v mains chargers in Caravans and Motorhomes that don't support AGM batteries. The Alternators don't either, often charging at much less than the 14.4v the battery industry believe is the norm. Some UK motorhome Alternator charge systems are so poorly designed that In recent tests the Alternator voltage reaching the Habitation area batteries was as low 13.4, less than a mains batteries 'trickle' charge, and typically 13.7v. This isn't just the odd motorhome, but the majority of UK motorhomes are charging the habitation batteries at well below their potential. You can probably imagine how an AGM battery, that requires 14.8v, will last at being so under charged by 13.7v? Alternator Charging Of AGM Batteries? This recent MMM Forum thread below documents how prevalent poor Alternator charging of the Leisure batteries is in the majority of UK motorhomes. While wet/flooded batteries will be tolerant of these conditions, AGM won't, leading to premature AGM battery failure and loss of capacity. Explosion of the battery or fire is also not unknown with AGM batteries, which are more prone to Thermal Runaway than other Lead batteries. The Forum thread below has contributions from many different people with differing views representing a broad spectrum, yet the ultimate conclusion is very different to that perceived by the battery Industry. It highlights how many Motorhomes have Alternators that don't achieve the expected 14.4v charge rate. In the above MMM Forum thread, while much of the evidence we put forward is contradicted, several real world examples then go on to back up our statements. "All I can say is... lesson learned and point taken Allan........ my (Alternator charge) voltage was a miserable 13.7-13.9V"
Well done those guys, you are streets ahead of the NCC who heavily promote unsuitable AGM's without any such warning. Alpha Batteries have also changed their web site so that the 'Home' page for Leisure batteries are Quality Batteries. Not one inappropriate AGM battery is being 'pushed'. That turnabout in now acknowledging an AGM's true disadvantages fits in exactly with the reported premature failures in the automotive World and them being withdrawn and swapped for Wet Acid/Flooded batteries. AGM In The Automotive World. Audi, VW, Seat and Skoda are ditching AGM batteries from their cars and are moving back to Lead acid Wet/Flooded technology that are also lower cost than AGM. Allegedly BMW are preparing to do the same. Some BMW Dealers have been replacing failed AGM batteries with a Wet Acid technology version, Enhanced Flooded Batteries (EFB), for some years to very good effect. While 'Not so heavy duty on paper' EFB last much longer than AGM in real use. Landrover are also moving away from AGM. Mercedes have already swapped one of the two AGM batteries in the the highline cars to EFB technology, and the rumours are the other battery will follow soon. Just like in Motorhome use, the general view in the battery industry now is that AGM just don't deliver the promised performance. We started this page some years ago because as far back as 2014 we began to see Motorhome and Caravan Electronics being damaged by prematurely degraded Absorbed Glass Mat (AGM) batteries. AGM batteries typically require a 14.8v charging rate for maximum performance and life when almost all the UK Motorhomes/Caravans have, at best, a mains 14.4v, or at the worst, a 13.5v charger. In this instance you can also see restrictions for the current, in the case above, a Maximum 25amps continuous. You will note this is a maximum, not the ideal for long life. This re-inforces the information in the Victron charts below on temperature and charge current. Ask yourself why you don't find such information on the casing of a wet Acid battery? So how will an AGM fare on a Swift motorhome with a 14.3v Sargent PX300 and an Alternator output that struggles to reach 13.8v? Logic suggests it is going to be very slow to charge or even fail to get fully charged, failing prematurely and this is exactly what is being witnessed. If an AGM battery is not getting fully charged, then the 95Ah a motorhome owner thinks he should have could be as low as 75Ah in the real world. We don't know of any Caravans that rolled off the production line up to 2017 with AGM optimised chargers. The 'new' Sargent EC160 and Super 151 are fixed voltage (13.5v) low current chargers. Old fashioned wet acid only, 1980's style chargers. Not multi stage or multi technology, yet these have been launched in the last few years by Sargent. Only a very small percentage of UK Motorhomes, probably less than 1%, actually have AGM optimised mains chargers capable of 14.8v charging. Less than 0.05% have an Alternator charging system that gets anywhere near 14.4v, let alone the 14.8v most AGM's benefit from. Typical UK motorhome habitation battery charging voltages are less than 13.9v, as witnessed by the MMM thread above. Swift are not rolling out AGM optimised Solar regulators with their new 'AGM' policy, just using the old 13.8v continuous charge Solar Regulator. One thing AGM batteries really don't like is being continually charged when the battery is already full, for it to be done at the wrong voltage is a double killer.. But regardless of the above and whether we are to be believed, AGM technology hasn't delivered and is being ousted by the newer, more tolerant, lower cost EFB wet Acid Technology. BMW, AUDI, VW are proof of that. Don't let the Dealer fit an AGM battery in your motorhome. When AGM batteries have demonstrated they don't deliver, it's time to think more about EFB which are 100% Motorhome and Caravan compatible. Hence Yuasa launching their latest Leisure battery, the new Yuasa L36-EFB with best in class performance at 'Budget' money. Banner have launched many EFB batteries with more to come and make the point on the website they work well with ALL existing Caravan and Motorhome chargers. Banner also specifically state that "EFB is the technology of the moment". Technical Information To Support The Above. For years Wet/Flooded Acid batteries have happily tolerated recharge voltages from the 13.8v of a typical Caravan power supply/charger to the very high 16v output by Ford Cars and Vans. But AGM batteries are very fussy about several factors, not just voltages. AGM batteries can display deep cycle characteristics in laboratory tests, but only within very narrow confines and limitations of operation which are rarely achieved in the field. Confines such as an exact charging voltage, narrow band continuous current draw limitations, plus the most crucial : temperature operation. If the battery is operated outside these narrow limits, battery life won't be the 10 year life you have every right to expect from a £200 AGM battery, but usually less than two years. Did you know that when an AGM battery goes through it's Laboratory 'Cycle' testing to assess it's capability, it sits in a bath of cold Water to keep the temperature low and constant? With AGM batteries being so susceptible to temperature highs, it is likely to deliver a lot more cycles in the Lab than it can ever achieve in real world Motorhome use. Hymer fitted AGM batteries as standard habitation area units as early as 2013, without any regard for the none AGM charger that it was paired with. Their publicity said the AGM batteries would be fine on a 'Gel' profile setting. They weren't, they failed very quickly and rarely charged up fully. They took a lot of bad publicity on the forums so Hymer spent a lot of money rushing through a mains charger that did have an AGM optimised voltage setting. But they didn't address the Alternator 'low charge' voltage, which wasn't optimised for AGM's need for 14.8v, so AGM batteries in Hymer Motorhomes continue to have short lives. Only at the end of 2017/early 2018 did some Mercedes chassis have a device fitted to provide an uprated Alternator output. Now Swift are going down the exact same route. So why aren't AGM any good as a Motorhome Leisure battery? Well let's consult Victron Energy, the biggest specialist Deep Cycling battery and Battery Charger manufacturer in the World. Aside from not being adequately charged by a Motorhome/Caravan charge AGM batteries have a finer temperature operating window. The below chart shows how half an AGM batteries life can be lost when operated at 'higher' temperatures. Just a 10 degree rise at the Plates, drops a high quality AGM batteries life down from 7 - 10 years to just 4 years. A 20 degree rise at the Plates, not that different to the internal temperatures of a motorhome/caravan in Southern Spain in Summer, drops a 10 year AGM to a meagre 2 years life. No wonder some consumers don't see an AGM battery last 12 months. These are not our charts and figures, but the highly respected Victron Energy findings. 30 degrees is not exactly a surface temperature that is going to burn your hands. The Leisure battery Plates may be going through torture, yet the casing hardly feel warm. This is not an issue unique to Victron Energy batteries, which we rate as some of the best Batteries in the World, it is an issue with all VRLA batteries from all manufacturers and has been known for years. It is the reason why Datacentre UPS batteries are often in cool, air conditioned environments. The charge current should preferably not exceed 0,2 C (20 A for a 100 Ah battery) otherwise the temperature of a battery will increase by more than 10°C". If the battery is already warm at 30 degrees, then a 25amp charge/discharge rate will see it rise to 40 degrees, you can see the potentially catastrophic effect this will have on an AGM's battery life, 75% loss of life time, according to the chart above. You can see now why so many AGM batteries list a maximum (remember that is not the 'ideal' which will be a much lower figure) charge current as well as the charging voltages. Obviously the same heat will be produced when the battery is discharged heavily. You can imagine what a 900watt/E Microwave drawing 140amps via an Inverter will do to an AGM? Yet some Battery Retailers actually recommend AGM batteries where continuous high current draw will occur,. As can be seen they are not the most suitable battery for prolonged high current discharges. Note on Microwaves : The real electrical rating of a "900w" microwave will be about 1,400watts as the 900w/E figure is only a guide to the 'Food Wattage', not that drawn from the 230v supply. Once you understand the above you begin to realise why the very latest cars still using AGM batteries have gone to such lengths to cool the batteries. One car we saw had the battery in the boot but took cooling air from the passenger compartment on the basis that the battery would only ever get a hard time when the car was occupied with the 'Air- con' activated to cool both passengers and battery. It also had two temperature sensors on the AGM battery. If the ECU detected an elevated battery temperature it slowed down charging by the Energy Recovery System, or even shut it off altogether. That is maybe why some battery manufacturers are now impressing the importance of temperature compensation charging with AGM's?. Shame not one mainstream motorhome/caravan rolling off the production line up to Feb 2018 had proper battery temperature compensation charging as standard. Some Sargent equipped chargers have a temperature sensor in the battery compartment, but not attached to the battery where it needs to be to work efficiently. Typically, conventional Wet Lead acid batteries suffer much less from temperature issues because the Acid is in a very fluid form, rising up the plates by convection and drawing fresh, cooler acid in from below. The mobile acid then carries the heat to the casing where it is dissipated. This keeps the Plate temperature significantly cooler. In an AGM the acid is almost immobile, absorbed in a Glass Matt, heat transferring only slowly away from the Plates. While conventional wet batteries can handle higher temperatures better than AGM/Gel, the Powerframe Varta LFD is more than twice as capable again. Extremely high temperature tolerant because of the corrosion resistant technology it uses.. 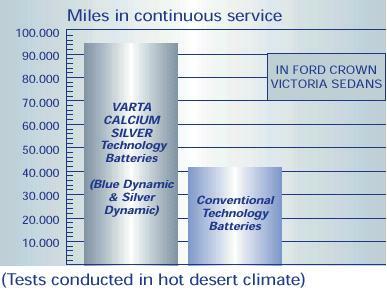 The chart below shows how, in hot desert conditions, a Varta/Bosch Powerframe battery outperformed a conventional wet acid battery by a ratio of better than 2 : 1. So if 'conventional' Wet acid batteries outperform AGM in higher temperature conditions, and Powerframe Bosch/Varta additionally outperforms conventional 'wet's' by a massive 2 to 1 ratio you can see the huge 4 : 1 advantage a Varta Powerframe battery has over AGM with major resistance to loss of life from temperature and higher charging/discharging currents. In real world Motorhome use, many batteries are used in the warmer months and/or warmer climes. The exact conditions that AGM batteries are likely to wilt under. In August 2018 Portugal was reporting temperatures over 40 degrees, it is likely the temperature of the battery Plates was nearer 50. Anyone whose AGM battery that did any work in those temperatures will most likely find the battery doesn't last more than about 12 months. Factor in the poor charging regimes that almost all Motorhome/Caravan chargers and Alternators will deliver, and the much hyped cyclic capability will rarely ever be realised to even half that claimed. Hence the many reports of short AGM battery life and the reason Banner now list this as a weakness of their AGM batteries. While some marketing leads us to believe that an AGM battery is tough, it is actually the most frail of the Lead Acid technologies. Yes they can have a decent number of charge/discharge cycles in a Water bath chilled laboratory environment, but that will only be replicated if the real world use, like charging/discharging conditions including temperature, are perfect. There is a very good reason why the Battery being voted 'Best for Trucks' is not an AGM, but a Wet/flooded battery. The latest big Truck Battery from Yuasa, that was originally scheduled to be AGM, is rolling off the production line using EFB technology. The myth that AGM batteries don't lose fluid or Gas out fumes is also exaggerated. They can and do gas, as shown by the document at the bottom of the page. An AGM battery has a valve in the top, the purpose of which is to maintain a higher pressure inside the battery to assist in recombining Hydrogen and Oxygen back to Water. Commonly known as Valve Regulated Lead Acid (VRLA) batteries. They are sometimes referred to as 'Sealed' batteries when they are not, as the Valve will, and does, open venting dangerous Hydrogen into the Motorhome. Almost all Gel and AGM data sheets contain warnings not to install these batteries in an enclosed space because dangerous gas can build up. What they should say is that AGM batteries only lose a small amount of Gas/Fluid in normal use. Except that a Motorhome habitation is a very hostile environment for an AGM. Some Charger manufacturers might tell you that their chargers are 'AGM compatible', but the AGM battery manufacturers websites disagree. Any old charger with more than about 14.3v may 'charge' an AGM battery, but it won't necessarily charge it properly or quickly. If a chargers advertising blurb states it is 'AGM compliant', but it does not have a separate 14.8v AGM specific charge profile, such as the Rovert charger range which has only 14.4v 'Wet' and 'Gel' settings, then the retailer doesn't know their product. Victron Energy, Schaudt, Votronic, etc. spend thousands on developing charge profiles optimised to get the best from each battery Technology. I am pretty sure they would not spend that money if they could get away with a single profile? You can therefore imagine how good a 'low voltage' Sargent EC500/PX300 will be? "the voltage rises to 14.4V to deliver the bulk charge to the battery. When the battery is charged, the voltage is decreased at stage 3 to 13.6V to deliver a float charge to maintain the battery in the fully charged state". Yet Sargent also say in the same EC 500 manual, "The PSU is configured to work with standard lead acid leisure batteries, and in most cases is also compatible with the latest range of Absorbed Glass Matt (AGM) batteries". Note the wording of 'compatible', not optimised. To me that suggests it might 'work' but not the best it can be, when AGM need the best charging and operating conditions. "Before fitting non-standard batteries please check that the charging profile described in 3.3 is suitable for the type of battery by referring to the battery documentation or battery manufacturer". In other words, "we are going to save ourselves lots of R & D by telling you it's compatible, but if you trust us without doing your own homework, it's your problem". If you think the reason that 99% of british Motorhomes and Caravans failure to have an AGM optimised charger is historical, with lots of old fashioned, outdated chargers still in old vehicles from yesteryear, you would be wrong. Even the latest offerings from Sargent don't comply with the minimum stated spec of the big AGM battery manufacturers for even half reasonable AGM battery performance or life. Yes it is true that old fashion, single stage chargers of 13.5v - 13.8v dominated for most British built Caravans and Motorhomes up to about 2004. Chargers like those from Zig, Plug In Systems, BCA, etc were almost all 13.5v - 13.8v fixed output chargers, fitted in Swift's, Lunars, Coachman's, Elddis etc. The BCA/Powerpart unit alone is probably fitted in more UK Caravans than any other unit in the 'modern' British age. They were even being used in new Elddis motorhomes up to a couple of years ago. The BCA 13.8v (often actually less than 13.8v in real use) is still on sale now and often used as a replacement for other manufacturers failed factory original. Yet it has a weak 10amp/13.8v specification not suited to an 80Ah caravan battery, let alone a free camping Motorhome's 160Ah AGM battery bank. Around the year 2005'ish Swift started installing Italian designed Nordelettronica NE143, multi stage chargers that were probably the first efficient, modern battery chargers used by a main stream UK builder. With a 3 stage, peak 14.4v output, they revolutionised charging times and battery capacity. An indication of just how poor the UK Caravan industry is in this area, despite being designed nearly 15 years ago, the Nordelettronica NE143 units are, even now, amongst the most advanced in the sector. Sadly even the latest Nordelettronica UK spec charger version introduced in 2016 doesn't have an AGM charge profile. But it has gained a charging profile for Gel, which incredibly, was a milestone for the UK market as Gel charging profiles are almost as rare as AGM. Both the latest Sargent 151 with it's fixed, single 13.8v output and the EC600 with it's peak 14.4v wet acid only battery output, were released in the last 2 years. That's right, the Sargent EC151, a '1980's single stage specification' charger, with a fixed 13.5v, weak 10amp output was released in 2017. Incredibly, the very poor Sargent 151 is one of the best selling after market chargers in the UK. These are recent introductions, yet most definitely not modern, but still don't have an AGM charge profile or even Gel. Even in 2018, few main stream UK built Caravans/Motorhome's have even a Gel profile, let alone AGM. The Sargent manuals state the chargers are "compatible with AGM batteries" which clearly isn't the way the battery manufacturers see it. Every topline AGM Leisure battery battery manufacturer insists on a minimum 14.7v and Victron Energy suggest 14.9v gets longer life and a fuller charged battery. We have seen AGM's on a 13.5v Sargent 151 that won't achieve 80% capacity, even after charging for days. Clearly Sargent don't have it right, but then a disparity between the Sargent version of what is good for a battery and what the battery manufacturers say has arisen before. The Sargent manuals speak of a feature that shuts down the system when it drops below 9.0v - "...to protect the battery from severe damage". I think every battery expert in the country would say that battery damage had already occurred at 11v, never mind 9.0v!!! Yuasa, and all other manufacturers, state that for maximum battery life, a Lead acid battery should not be discharged below 50% Depth Of Discharge (DOD). For a modern battery that is between 12.5 and 12.2v depending on the Technology in the battery, as it is the technology in a battery that dictates the battery State Of Charge voltage. The industry say a Leisure battery can be discharged lower than 50% DOD in an emergency, but 12v should be regarded as a fully discharged battery. Dropping below this level is acknowledged to severely shorten lifetime. It isn't just a minor anomaly either, the industry say we should regard 50% DOD as 'fully discharged' for all intents and purposes which is about 12.2v, so Sargents '9.0v' cutoff to 'protect the battery' seems to show that they don't understand batteries, so not surprising they think 14.3v is ok for an AGM. There was a brief glimmer of UK Charger technological enlightenment when Sargent introduced the excellent Dutch designed and built Sargent EC325 charger, which boosted the voltage of the charger to up to 18v, if it thought the battery needed fast charging. Very clever, very well made unit. But while a tolerant Wet acid battery would accept that, as shown by the Ford Silver wet batteries that survive for years on a peak 16v charge, 18v would degrade a Gel or AGM Leisure battery in months. The Motorhomes built on the continent are altogether different in Charger design. The likes of Hymer, Burstner, Frankia, Pilote, Knaus, CI, etc. had a higher technological approach to battery charging in a Motorhome right from the early days. For example, it was normal as far back as 1999 for a continental built vehicle to have inbuilt automatic, simultaneous charging of the Starter battery as well as the Leisure battery when on mains EHU. Even in 2018, some UK built Motorhomes still require manual selection of charging either the Starter battery or the habitation area battery, but not both at the same time. The latest 'new for 2017' Sargent EC600 still requires manual switching between Starter and Habitation area battery. So does the recently updated EC160. Multi stage fast charging became common on european built vehicles from around 2001. Most Continental vehicles had a Gel charging program as well as Wet Acid, as far back as 2002. AGM charging profiles were introduced by Hymer around 2015/2016. Their new Solar Regulator got AGM optimised charging at the same time. The rest of Europe began options of AGM charging profiles around 2016/2017. Some have never offered an AGM option, preferring, correctly in our opinion, to believe that Gel batteries are a more 'durable' option than Gel. As an overall percentage of the UK Caravan and Motorhome market, the inbuilt chargers with an AGM profile is very, very small. We would guess at less than 0.1%. Although the scheme lists a number of AGM batteries, nowhere does it state that AGM batteries require a specilaist AGM charge profile rarely found on Motorhomes and almost NEVER on Caravans. The scheme specifically proposes AGM batteries for Motormover equipped Caravans without any regard for the charger that is likely to be installed, when many may be 13.5v low current chargers. Yet the scheme states, "buying an NCC Verified Leisure Battery gives consumers confidence that the battery they purchase for use is fit for purpose". The NCC seem to be promoting the most expensive batteries that will then have the shortest lives. Almost as though the NCC are working at helping the Battery Industry that funds them, not the consumer? Until recently Banner Batteries were the only company warning on their website that an AGM Battery should not be retro fitted to a Motorhome or Caravan that did not have one when new. But retailers don't seem to be passing the information on. Nor is the NCC verified scheme. Can a Wet battery really have more Charge/discharge cycles than AGM? Even if you ignore all the above, the pennies just don't add up when it comes to AGM. £ for £ a Yuasa L36-EFB battery will out perform an AGM battery in almost every area, even outperforming an AGM on cycle life. An AGM might have nearly double the cycle life on paper, but then it costs twice as much. £ for £ you can buy two Yuasa L36-EFB's for the price of one AGM. Two L36-EFB's, used one after the other, will supply 460 REAL cycles versus an AGM's 350 'claimed' cycles. Example : According to the NCC Battery verification web site, a Banner AGM of the same physical size delivers 350 cycles at a cost of around £210, versus the Yuasa L36-EFB 230 cycles at about £110 each. So for a similar £210'ish expenditure you could run two Yuasa L36-EFB's, one after the other, for longer overall life than the cost of a single AGM. That actually makes the two Yuasa's more cost effective at 460 cycles vs the AGM's 350 cycles. 110 more cycles for almost the same money, and that assumes that the AGM will deliver those cycles, which history has shown it won't. Not only does the L36-EFB last longer, but most of those cycles would be more usable with more fully charged, higher capacity batteries without any of the limitations of an AGM battery. For almost the same £210 you could install two Varta LFD90's coupled together and discharge each battery to just 25% Depth Of Discharge (DOD) vs a single 90Ah AGM discharged to 50%, to withdraw the same usable 45Ah. A battery discharged to just 25% DOD will have more than twice the cycle life compared to a single battery discharged to 50% DOD, so a pair of Varta/Bosch Powerframes used in this way will deliver nearly 500 cycles, out performing the AGM's 350 cycles by a huge margin. The Varta solution would also be a more flexible 180Ah setup where, in an emergency, you could draw up to 90Ah. Obviously taking the same 90Ah out of a single 90Ah rated AGM would severely shorten it's life. In monetary terms, the AGM's claimed extra cycles over Wet Acid is misleading. In real World use a Yuasa L36-EFB or Varta/Bosch Powerframe battery will outperform an AGM, even on cycle life. If all that is true, why are Motorhome manufacturers fitting AGM batteries as standard? AGM batteries have a long shelf life, old fashioned 'conventional' Wet Acid batteries don't. A conventional Wet battery, like a Banner Energy Bull, can discharge on the shelf to debilitating levels inside 3 months. Such a level of discharge will lead to Sulphation and deterioration. When a Motorhome can be sat on a Dealers forecourt for many months, that is a big annual cost in replacement wet batteries and subsequent damage to the charging systems. Secondly, if an AGM battery does get discharged at the Factory/Dealers, it can usually be recharged with less obvious signs of trauma. Even though it has suffered damage it will initially hide it. That applies to AGM batteries in the storeroom as well as on the forecourt. The AGM battery might cost a little more upfront, but that cost is passed on to the customer. The convenience to the Dealer/Manufacturer of installing the perfect battery for them, costs them nothing. Now that AGM batteries have been shown to be a poor performer and EFB has been crowned the new technology 'King', I would expect more EFB batteries to go on sale with fewer AGM's. If you look at the document below, supplied by Concorde on it's range of top flight AGM batteries, you will see Chapter 6 contains warnings about the dangers of gassing from all VRLA/AGM batteries, not just their own. Also look at the Warning on page 21 "because significant amounts of Hydrogen gases may be released from the battery". So not only do AGM VRLA batteries lose fluid, but when voltages, and especially temperatures, get a bit high, that turns to significant levels of Danger. The manufacturers are telling us the way it is, it just isn't being relayed by the retailers who are distorting the truth. Please do not fit AGM batteries inside the habitation area of a Motorhome unless there is a vent pipe to the outside OR you fully understand the risks. As it says in the Concorde document, NEVER install a VRLA battery inside a sealed container. That might mean thinking carefully about battery lockers, some of which do not have any venting. We welcome all feedback, good and bad.